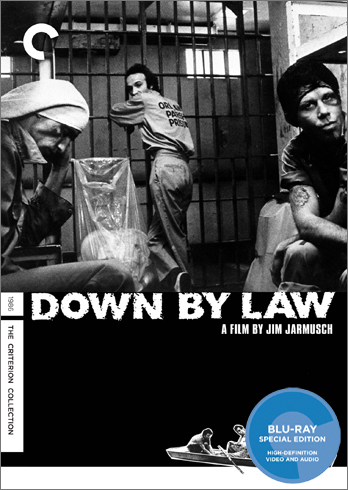 Jim Jarmusch's third feature, Down By Law, incorporates the mechanics of and archetypes from some familiar American genres — most notably prison break and film noir — and blends them up into an indelibly unique work. It's a film that can feel unfinished, and not just at its wholly inconclusive stopping point; some scenes are cut off before seemingly important details are revealed while others seem to stretch on and on. Jarmusch has never been a filmmaker terribly interested in plot, and Down By Law is no exception. Instead, we get a brilliantly sustained mood piece, an oddball fairy tale populated with memorably distinct performances and plainspoken yet gorgeous black-and-white photography from Robby Müller. Set in New Orleans, the film introduces us to two guys down on their luck. Zack (Tom Waits) is an erstwhile DJ (radio name Lee "Baby" Sims) who's being thrown out by his girlfriend, Laurette (Ellen Barkin). Jack (John Lurie) is a working-class pimp, impossibly cool but perhaps too self-assured. Both men find themselves set up for crimes they didn't commit and shuffled into the same jail cell, where they develop a tolerate/hate relationship. Thrown into the mix is Roberto (Roberto Benigni), an Italian alleged murderer who barely speaks English and keeps a constantly updated notebook of American idioms. Roberto's irrepressible enthusiasm stands in stark contrast to the too-cool-for-school Zack and Jack, but being a dreamer is a fine quality to have in Jarmusch's slightly off-kilter version of Lousiana. It's Roberto who discovers the means for escape, plunging the trio into the swamps where they might wander around in circles forever or they might discover an idyllic, remote store run by an angelic Italian woman. Every shot choice, from the graceful on-water tracking shots in the swamps to the extended, static takes in medium shot inside the prison cell, feel perfect. Lurie's aloof coolness, Waits's devil-may-care gruffness and Benigni's childlike optimism are perfectly complementary parts. Jarmusch's odd rhythms clearly fit the material perfectly once you get used to them. Down By Law may share a lot in common with other Jarmusch films, but that hardly makes it any less one-of-a-kind. Down By Law is presented in 1080p high definition in Jarmusch's preferred aspect ratio of 1.78:1. This is one of those titles Criterion included in an Amazon poll about three years ago asking fans to choose the next Blu-ray upgrade from a list of five (Howards End won; meanwhile, we're still waiting on Kwaidan and Picnic at Hanging Rock). The wait was worth it, as this is an impeccable, stunningly beautiful transfer. Blacks are incredibly rich and deep, while whites are clean and sharp without losing detail. Down By Law has a richly detailed, nuanced grayscale, and this transfer serves it beautifully. A nice layer of film grain is present but never overwhelming, and damage is virtually nonexistent. This marks a major upgrade over the 2002 DVD. Audio is presented an uncompressed monaural soundtrack that is very clean and gives the dialogue-heavy film excellent clarity. The Waits songs that begin and end the film sound excellent as well. Alternate music-only and French-dubbed tracks are also included. Everything from the 2002 two-disc DVD set is carried over, and though it's a collection that's heavy on audio-only extras, it's a strong lineup. On the audio-only side, we get a lengthy interview with Jarmusch that essentially functions as a commentary track as he talks in depth about the conception and production of the film. There's also an audio Q&A where Jarmusch answers fan-submitted questions and recordings of phone conversations between Jarmusch and the three principal actors. A video interview with DP Müller features him explaining his approach to shooting the film, while footage from the 1986 Cannes Film Festival offers a press conference excerpt and an interview with Lurie. Sixteen deleted scenes/outtakes, including an alternate ending are also included, along with the Jarmusch-directed music video for Waits's cover of Cole Porter's "It's All Right with Me." Production Polaroids, location stills and the film's theatrical trailer round out the disc. The package also includes an insert with a brief essay by Luc Sante. A significant A/V upgrade from the DVD, Criterion's Blu-ray edition of this great Jarmusch film comes highly recommended.